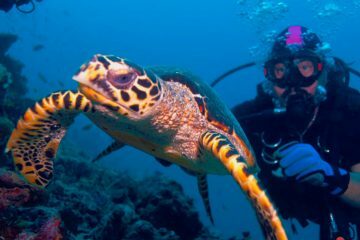 The excursion offered by Bob Diving, from Puerto Colón in Southern Tenerife, is not usually seen on coastal cities. It consists in a water immersion with sea scooters; once under the water’s surface, you can admire the fishes swimming around, the seabed with its rocks and corals, and all those details that make this kind of scenery really unique, especially in Southern Tenerife. At first, you will be surprised by your capacity of immersing yourself, breathe peacefully within those big vehicles and see with total clarity under the water’s surface; you will see the seabed much better and find less limitations than in scuba-diving, where you have to swim and breathe through the tube or with an air tank. 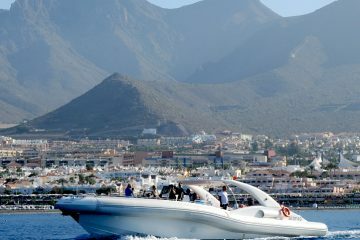 After leaving the harbor, the boat heads toward a small cove, home to a huge diversity of species – so is the whole coast of Tenerife – where after receiving some information relative to the precautions that must be taken, such as underwater communication signals with the instructors, we start immersing ourselves into the water. 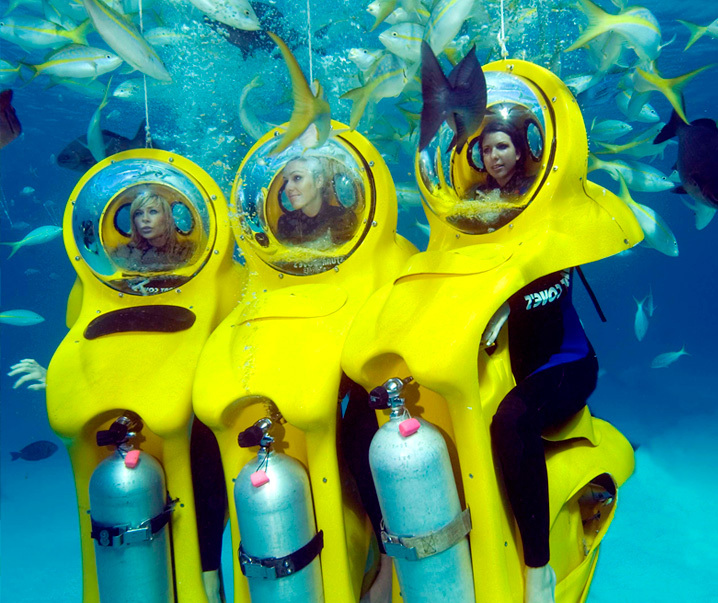 Once under the water’s surface, you will be able to admire all the fishes and aquatic flowers which decorate the seabed but also to accelerate a bit with the scooter, while the instructors record the video of your whole experience. As mentioned earlier, this is a unique excursion you cannot miss in Southern Tenerife and a great opportunity to immerse yourself and ride a small sea scooter while seeing everything and breathing normally from the bubble head. Founded in 1997, Bob Diving guarantees that their sea scooters are safe, easy to drive, and above all very funny. Don’t miss the opportunity to enjoy a unique submarine experience ! Be more than 1.40 meters tall. Be less than 75 years old. You can participate in the excursion wearing prescription glasses or contact lenses. The minimum height is 1.35 meters (about 5 feet) to be able to breathe. Good health condition and know how to swim. The minimum age limit is 10 years old and the maximum one is 74.